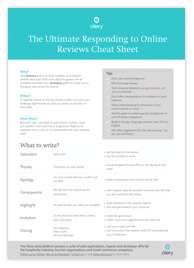 A few months ago we published a thorough guide to responding to online reviews. The guide aimed to help hotel managers to address issues mentioned in the reviews, react to negative reviews and to provide basic rules of thumb. If you enjoyed reading the guide, then we have even better news for you – to make referring to the guide even more practical, we are now releasing the guide as a one-page cheat sheet! This way, you can print it out and have it ready next to your computer, to quickly refer to it whenever you need.